It’s been 13 years since the last new episode of Hey Arnold!, “Phoebe’s Little Problem/Grandpa’s Packard,” aired on Nickelodeon. But the show’s true finale was “The Journal,” a two-part, story-within-a-story that told the tale of how Arnold’s absent parents met, married, and gave birth to a son in the fictional, Central American republic of San Lorenzo. Ending with Arnold’s discovery of a map that could lead to his parent’s whereabouts, the episode was intended to set up a second Hey Arnold! feature film, but those plans were scuttled, leaving fans of the show waiting indefinitely for a follow-up. Mason Vale Cotton, Francesca Marie Smith, Benjamin Flores Jr.
Now, that follow-up has arrived in the form of Hey Arnold! The Jungle Movie, in which Arnold will finally, maybe learn what happened to his mom and dad when the kids from P.S. 118 trek to San Lorenzo. Craig Bartlett returns to his creation in the first of a host of Nicktoon revivals planned for the next several years, including movie sequels for Rocko’s Modern Life and Invader Zim. If The Jungle Movie is any indication, the process of bringing the sensibilities of these 1990s and 2000s cartoons into the 2010s will be a smooth one. The Jungle Movie maintains Hey Arnold!’s warm tone and careful pacing, its willingness to let its young characters absorb dramatic moments and contemplate within silences. It’s not an aesthetic many kids may be accustomed to—today’s youth-oriented programming is geared more toward wackier, faster-paced TV animation—but newcomers familiar and comfortable with an energy that’s between Steven Universe and Gravity Falls will be satisfied. And the Hey Arnold! vets will feel right at home, noticing various deep-cut references to the show that rarely distract from the story being told. The Jungle Movie’s strengths are in the quiet moments, the ones in which the camera lingers on characters at their most emotionally honest and vulnerable, or when it tracks across city landscapes populated with people engaged in their own lives. The film utilizes montages for concentrated community work or emotional poignancy: Arnold’s grandparents (Dan Castellaneta and Tress MacNeille) confronting their grandson’s desire to ditch the class trip and search for his parents, or the testing of the complex, tenuous relationships between Arnold (Mason Vale Cotton), his best friend Gerald (Benjamin Flores Jr.), and his schoolyard bully/secret admirer Helga G. Pataki (Francesca Marie Smith). 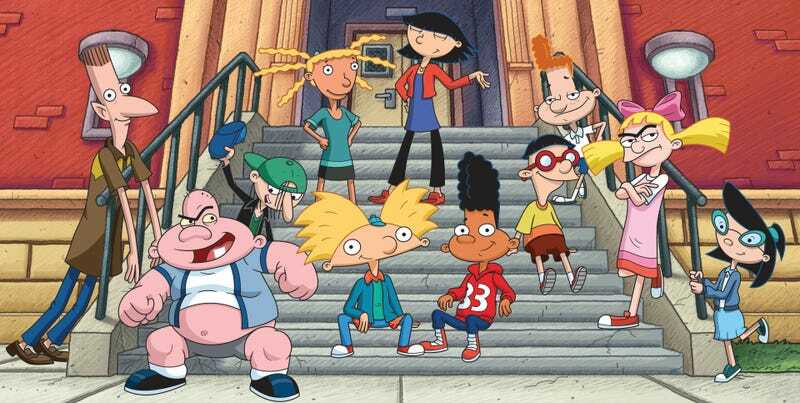 Letting characters and moments breathe was always Hey Arnold!’s hidden forte, and the same is true of The Jungle Movie. Bartlett and his team also recognize the power of small, mundane objects, their symbolism hitting with the proper significance. Necklaces, treasures, and ratty journals have their visceral power, but even a quick shot of a playground slide resonates in the moment. These are just one component of The Jungle Movie’s visual prowess; the muted orange/purple/red color palette of the show has been greatly expanded for the movie, with more vibrant colors used for a brighter look, both for the city and jungle environments. The character designs are perfectly suited for Hey Arnold’s updated, 2017 look; nothing feels out of place except for a final 3-D-rendered locale that fails to awe as intended. Jim Lang’s delightful, jazzy score returns, beautifully mingling with more tropical sounds once everyone arrives in San Lorenzo. The voices are pitch-perfect, too; 13 years haven’t diminished Francesca Marie Smith’s vocal prowess as Helga a single bit, and while Benjamin Flores Jr. sounds a bit off as Gerald, he still acclimates to the character in fine form. A couple of coincidences and plot conveniences come off a bit too contrived, and at times, The Jungle Movie strains the logic and credibility of its own world. Every so often, it feels like Hey Arnold! is extending itself to the extreme, a flaw that also marred 2002’s Hey Arnold! : The Movie. The Jungle Movie tries to lampshade or wink toward those extremes; Gerald even mentions how the contest that takes the characters to San Lorenzo seems “designed for” Arnold. 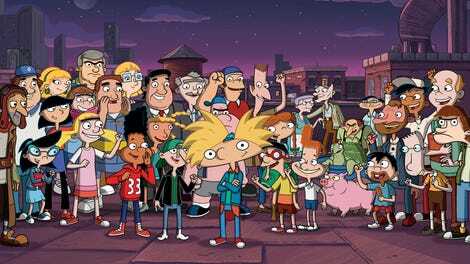 Plot twists and revelations soften some of the contrivances, but they still feel like high-octane incidents meant to justify the cinematic stakes encroaching on Hey Arnold’s understated, wistful norm. (As a warning, there are some gruesome, offscreen occurrences here and there.) But while the first movie got caught up in its energetic story, The Jungle Movie takes more care to pull back for those richly muted moments, filled with reflections, regrets, wonder, magic, and hope. There’s plenty of humor as well: Lovable lummox Harold is still as amusingly clueless as ever, and the way the movie deals with the antiquated Pataki family business—Big Bob’s Beepers—is bluntly, ridiculously hilarious. Because more than any of that, this is the story of Arnold, voiced perfectly by Cotton, the last of Mad Men’s many Bobby Drapers. Arnold is the quietly grounded, positive kid who lives and breathes hope, who in his own way gave that hope to a city and its citizens. In his quest to find his parents, he is taken out of his urban comfort zone, a place in which he is well-known and trusted, and thrust into the unknown, where his faith, resolve, and friendships are challenged. Arnold has always been a kind of an outsider though, a loner whose drive has always been backed, however subtly, by the idea that his parents were out there, somewhere. Now he has the chance to find them, and Bartlett presents that search as the true, adventurous, heartfelt culmination that he, and Arnold, deserve after all these years.